Choose a range of strawberry varieties and you could be picking fruits from late spring all the way through to early fall. Start with variety described as ‘early-season’, followed by a mid-season type, before completing harvest with a late-season strawberry. An alternative is to grow everbearing strawberries, also known as day-neutral or perpetual strawberries. These types yield their fruits in smaller quantities from early summer right through to autumn, which is useful if you’ll be eating them fresh, but for jam-making its best to choose varieties that produce a lot of strawberries over a shorter period. Alpine strawberries offer a lower maintenance alternative. These plants can be left to sprawl between ornamentals and will naturally self-seed. Their fruits may be tiny but they have an incredibly intense aromatic taste. Our Garden Planner is a great tool to help you choose the best strawberries for your situation. Double-click on the strawberry icon on the selection bar to pull up the varieties box, then scroll through the drop-down list to select a variety. You can also click the plus button and hover over the information buttons for catalog descriptions. You even add your own variety, complete with customized spacing and dates. Strawberries like rich soil, so add plenty of organic matter, such as well-rotted compost, before planting. Strawberries will grow in partial shade but yields will be lower and harvests a little later, so a sunny position is best if possible. 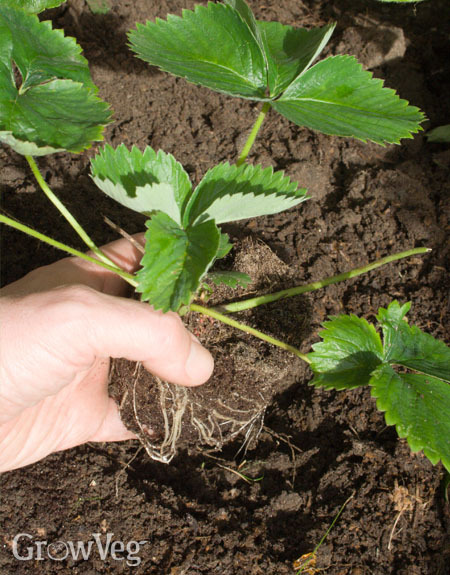 Plant your strawberries so that the base of the crown where the leaves emerge is at soil level. Space them 18-24 inches (45-60cm) apart in both directions to allow plenty of room for weeding, watering and picking. 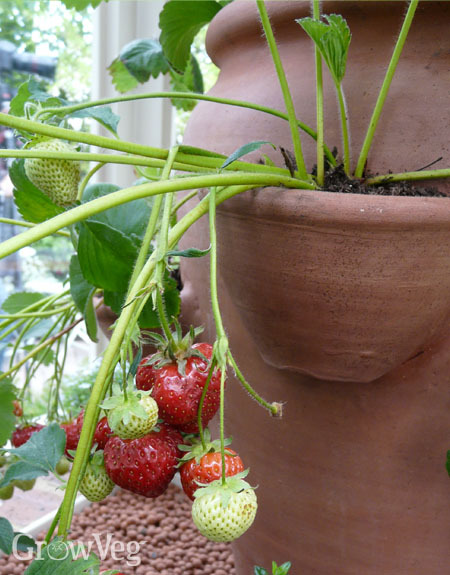 Strawberries also grow well in containers filled with quality potting soil where they can be planted a little closer together. You will need to water your plants more frequently because containers dry out rapidly, but the fruits are less likely to be damaged by slugs. For an extra-early harvest of strawberries, simply cover early varieties with a cloche, row cover or polythene tunnel from the end of winter. Once the plants come into flower, remove the covers on warm days to allow insect pollinators access. Forcing strawberries in this way will give a crop up to three weeks earlier. Keep plants well watered in dry weather so that the fruits can swell to a good size. Stop mud from splashing up onto the developing fruits by laying down special strawberry mats shortly after planting. Alternatively, use a mulch which will lock in soil moisture while keeping fruits clean. Straw is the traditional choice, hence the name strawberries. Maximize your harvest by using an organic liquid fertilizer that’s high in fruit-promoting potassium. As soon as the first flowers appear, start watering your diluted liquid fertilizer on regularly, at least every two weeks until they’ve finished fruiting. Natural plant fertilizers such as comfrey tea are ideal, or opt for a liquid tomato fertilizer as an alternative. Pull up any weeds that make it through the mulch, and in the first year remove any runners (long trailing stems) that appear. Once plants are mature you can leave some of these runners to grow into new plants. Slugs and birds love strawberries just as much as we do. Beer traps can be used to contain slugs, while netting is a must as the fruits begin to ripen. Get this in place in good time and tuck it in at the edges to avoid birds becoming trapped underneath. Ah – the moment of truth! Pick your fruits as soon as they’ve turned red. Enjoy them as soon as possible after picking. You can use a refrigerator to store the fruits, but this does impair the flavor and aroma of the fruits. Once the plants have finished fruiting, the foliage can be cut back to leave just the young, central leaves intact. Remove any straw mulch and add it to your compost heap. A just-picked, sun-warmed strawberry almost melts in the mouth, and by growing your own you can guarantee the very freshest fruits. We’d love to hear your tips for growing strawberries, so don’t be shy – share them by dropping us a comment below. "I've read about people growing asparagus and strawberries together. Have you tried this? They say to plant two plants between each asparagus plant, which is much closer together than you recommend here. Is this overcrowding going to cause problems with pests or lower yield? I'm planning to plant into raised beds. Many thanks"
"This is classic intercropping. The ferny asparagus foliage should let through enough sunlight to allow the strawberries to grow well. I have seen this done before. My advice would be to allow a little extra space between the asparagus plants - perhaps another 30cm / foot or so - to give the strawberries a bit more room. This will still represent a space saving compared to growing them both separately. As the asparagus bulks, the strawberry plants can always be moved on elsewhere." "Thank you for the useful information. Last year I planted new strawberry plants into a strawberry planter using multi-purpose compost, being careful about the crowns. Although I fed and watered the pot appropriately, including the little side planting places, the plants did not appear to be too happy and there were very few strawberries. Should I have used a different compost? Thank you!" "Hi Ann. Strawberries do need a good sunny spot in most instances, so that would be a priority. They also hate sitting in excessively wet compost - so check that the pots are draining properly. Multi-purpose compost should be fine for strawberries, though for plants in the same container for longer than a year, a soil-based compost, such as John Innes Number 2 or 3, would be better as it gives better drainage and better supports plants growing in it longer term. Strawberries do take a year to get into their stride and reach full cropping potential, so it could just be that they were still quite young and you'll get more fruits this summer." "Thank you Ben. I will repot using a John Innes compost - fingers crossed!"